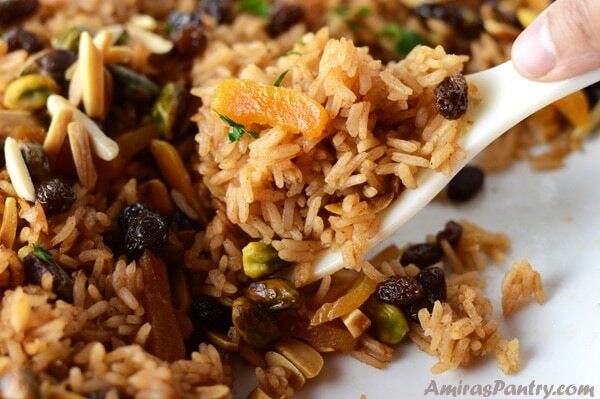 Fluffy, fragrant rice pilaf with crunchy nuts and mildly sweet dried fruit. 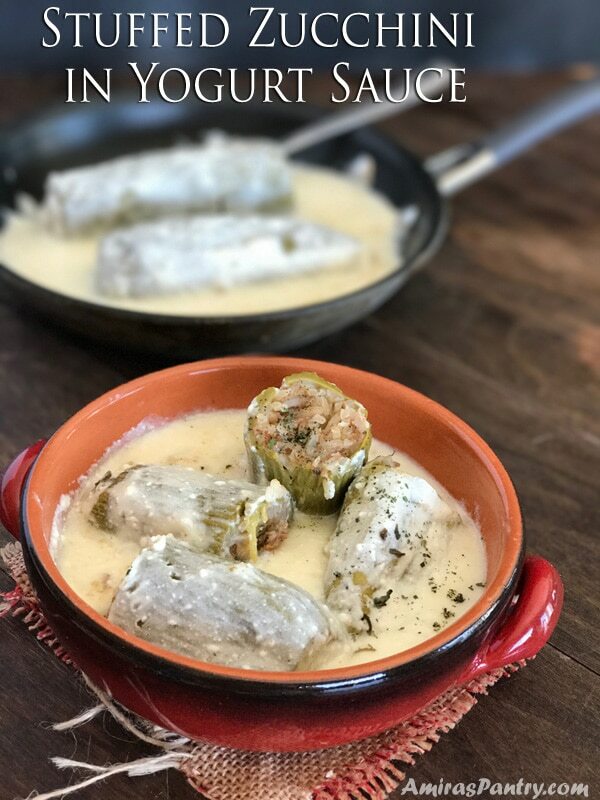 A great side dish for the holidays and gatherings. 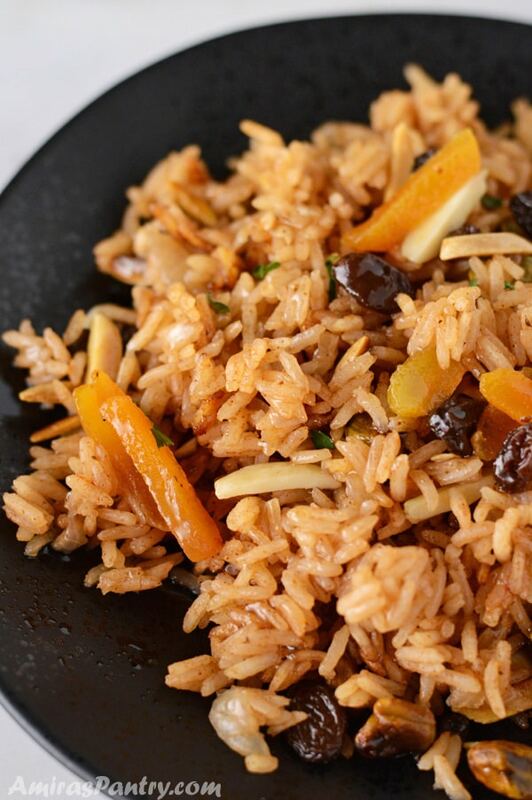 Mediterranean rice pilaf is lightly spiced and perfectly seasoned. A meal on its own. This rice is the king of rice throughout the region. It is there in wedding parties, holidays and any gatherings for the matter. A great side for your turkey or rib roast. This epic golden rice will make everything tastes better. Check out this other recipe of cooking the same rice the old way. 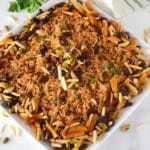 This rice pilaf is loaded with spices, nuts, and dried fruits to celebrate almost any occasion. It has earthy flavors and aroma that will melt your heart. A comfort food by all means. Rice is a staple in the region, it is eaten in great quantities especially at dinner. When I was growing up we only had two kinds of rice, short grain and Basmati. Later on, many other sorts were introduced in the market. One of my kiddos is obsessed with rice, he can eat rice at any time of the day. The most traditional rice that I cook is white rice with vermicelli or orzo. 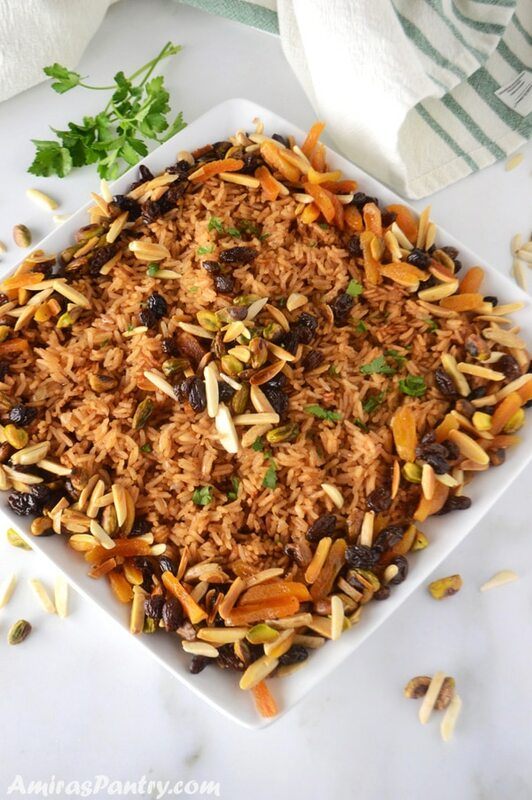 This is usually called the Lebanese rice, but it is widely popular in every country in the Middle East. Sticky rice though is not our thing. In fact, if you cook rice and it came out sticky is considered a disgrace to the cook . Rice should be fluffy, firm but cooked all the way through. Separated pearls or rice are highly appreciated in the region. For this rice pilaf, you can use any kind you like. My mom used to make it with short grain Egyptian rice as this one was the most available back in the days. Later she started making it with Basmati rice. I liked using jasmine rice for its light scent, but as I said you can use whatever you like. There are a lot of theories out there about this particular hot topic. Back in the old days, we used to pick rice as it had lots of debris. After picking it we used to wash the heck out of it. Washing is believed to let you get rid of surface starch. So traditionally rice is covered with lukewarm water, agitate with hands then drain water. Repeat this cycle for like 4-5 times until the water is clear. Most rice packages sold here in the United States says do not wash or just rinse. I usually just rinse the rice out of habit even if it says don’t :). But I never soak the rice even if it says soak. So you see I am a rule breaker here. Bottom line: depends on what you are used to and what you are comfortable doing. Period. What type of cooking oil and fat to make rice pilaf? Traditionally ghee is used and that’s what I’ve used here to show you the recipe. You can use butter instead of canola oil for a completely vegan recipe. I like canola oil better here as an alternative for vegans as it has a neutral flavor and does not conflict with the other flavors in the rice. How do you make a rice pilaf? 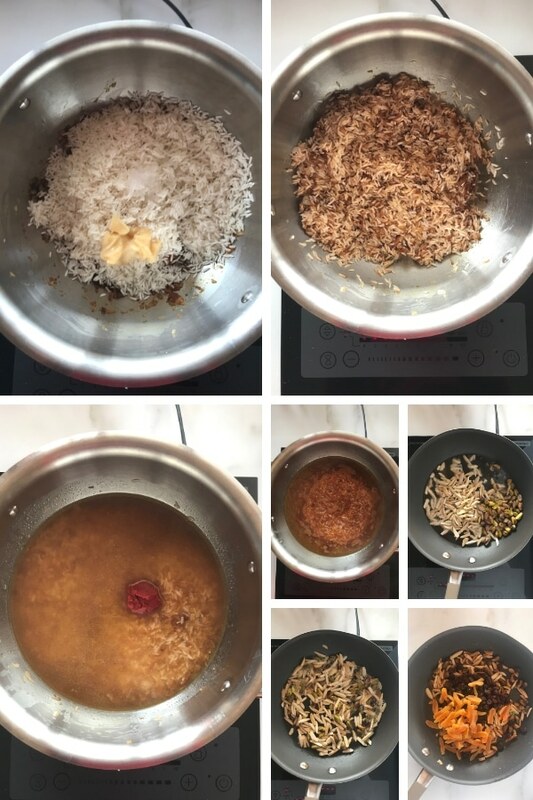 Here is a step by step of how to make this delicious rice pilaf. In a pot over medium heat, caramelize sugar. Just add sugar to the pan, stir as it will dissolve and begin to caramelize. Keep an eye on it as we do not want it to burn. Add onion and mix with the caramelized sugar for a minute. Mix in all the spices. Now add the rice and ghee. Mix everything well and keep stirring for like two minutes or so. Pour the cooking liquid and add the tomato paste mixing well to dissolve the paste. Season with salt. Bring the pot to a boil, then reduce heat, cover and simmer until thoroughly cooked and all the liquid is absorbed. Now in a skillet over medium heat, roast nuts in ghee/ butter or oil. Remove from heat and add in the cur dried fruits. Serve rice garnished with roasted nut mixture and parsley. Make your dinner table more interesting with this elegant rice pilaf. It is a pleasure for the eye before the mouth. Do not panic if part of the caramelized sugar gets stuck to the bottom of the pan, this will all come off when we add the cooking liquid. You can make this pilaf in your rice cooker from A-Z. 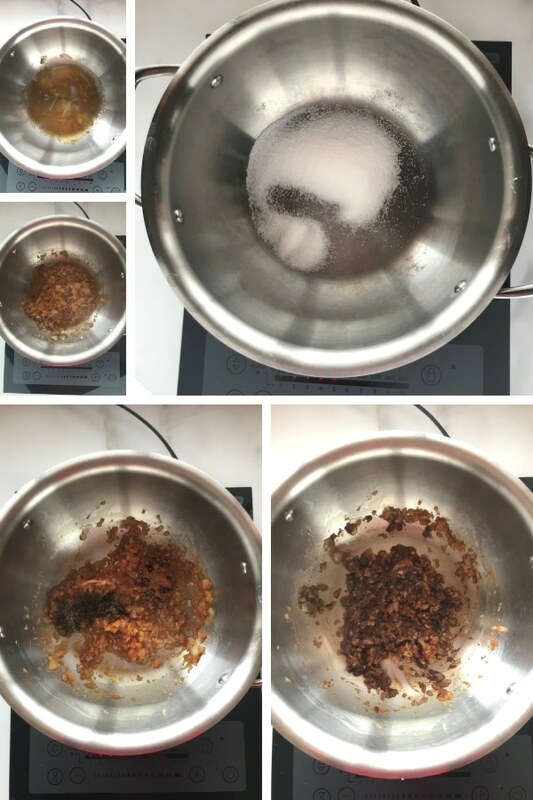 I’ve tried it before and I like it as you do not need to check for doneness especially if you are using a new to you kind of rice. Most rice cookers has saute options. So I made all the first steps on that setting then after adding the rice switch to white rice setting. Some people saute garlic with onions, I’ve never seen my mom does that so I stayed clear路. 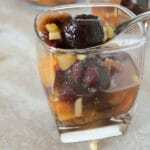 You can definitely use any sorts of nuts/dried fruits you like. Traditionally though, almonds and raisins are used. Here I’ve used pistachios and dry apricot for color as well. I also like the use of dry cranberry more than raisins but I just wanted to show you a more traditional dish. A dash of ground cloves. 1 Tablespoons ghee or butter. 1/4 cup dried apricot sliced. In a small bowl, soak raisins in some hot water for 15-20 minutes to get some of the sweetness out. In a pan over medium heat, add sugar and keep stirring until it caramelizes. Add cinnamon, black pepper and ground cloves, stirring together. Add rice salt and ghee, stir everything well together. Pour in liquid then add tomato paste, stir well to dissolve. Reduce heat to low, cover, and simmer until rice is tender and liquid is absorbed, about 20-25 minutes. In a skillet melt ghee, add pistachios and almonds stir for 2-3 minutes until lightly toasted, turn heat off. Drain raisins and add to the hot skillet along with the dried apricot and toss everything together. Serve rice on a platter garnished with nut mixture. 1) You can use any type of rice you like Basmati, short grain, brown just adjust the cooking liquid accordingly. 2) You can use any type of stock or even water,. In fact I like this recipe more with water. 3) Do not freak out if the caramel sticks to the pan it will all come off when we add liquids. 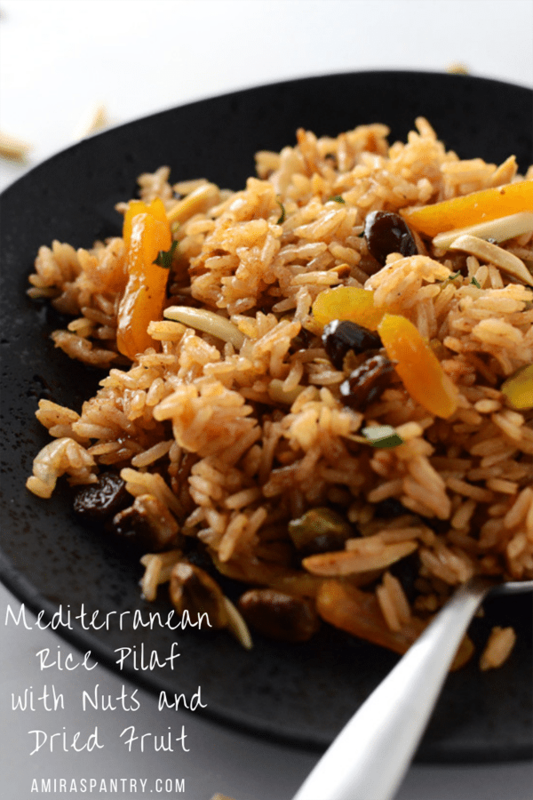 This Mediterranean rice pilaf would be welcomed in a winter setting, makes me feel warmer lol. 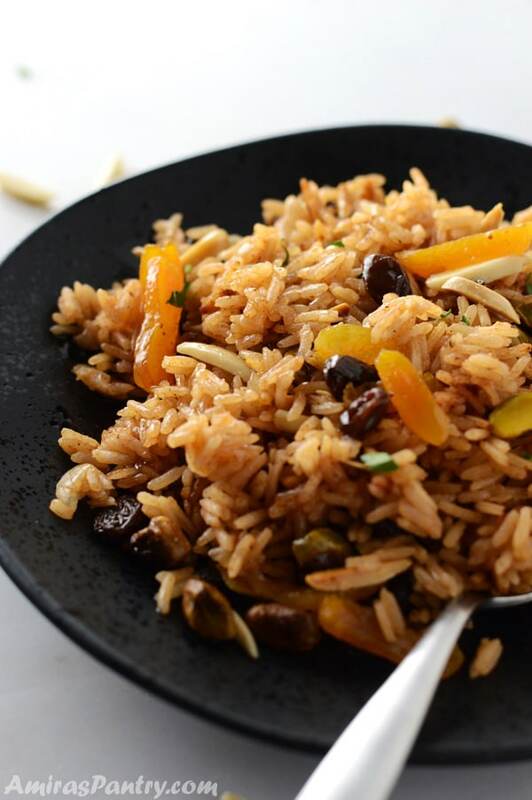 Gorgeous rice with wonderful flavors. Great tips. I just made a Persian rice with noodles, true it is more popular in other parts of the world. 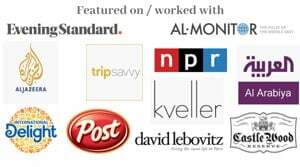 Here’s our syrian rice stuffing. Wash extra long grain rice till clear. Sauta lots of chopped celery & onions in clarified butter. In separate pan carefully brown plnolia nuts.After celery & onions are golden add rice & saute till opaque add broth ( chicken or vegetable) when almost cooked add more broth put in baking pan add pinolia nuts cover & back till done. Uncover & stir in 1 whole pomagrate arials or cranberries. Add salt & pepper as you like. Stir in 1 large bunch chopped parsley before serving. Delicious and beautiful. Can’t send measurement because my mom never measured anything. Please tey ot. Im sure that you’ll agree. Sherry this is lovely, I have to give this Syrian dish a try. 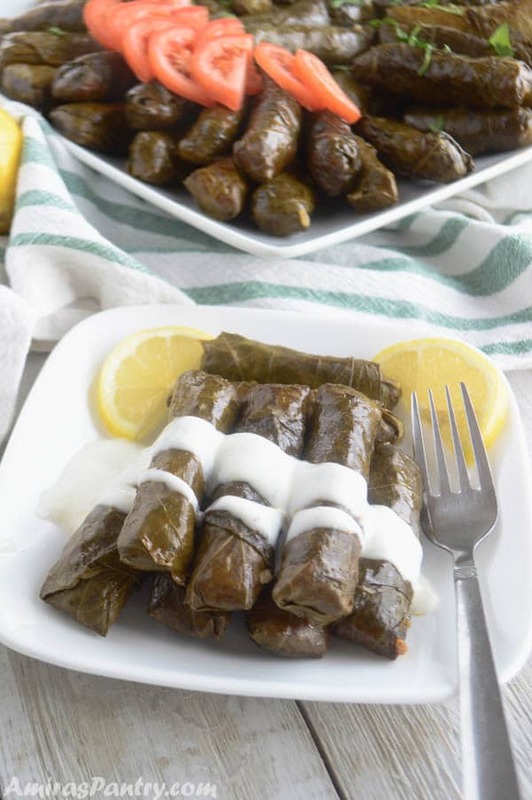 Love all Syrian food as I used to have lots of Palestinian and Syrian friends when I was young.